The Act of Parliament necessary for the construction received Royal Assent 29th January 1768. The original capital required to build the canal was £33,400 and this was raised by the selling of shares of £100 each. Original proprietors were restricted to purchasing no more than seven shares each. 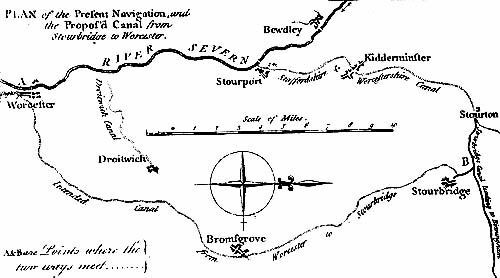 The engineer James Brindley designed the canal which is five and three quarter miles in length from Droitwich to where it meets the River Severn at Hawford. Brine springs enter the canal, making the water so strongly impregnated with salt that freshwater fish cannot live in it. Some springs may be seen where the canal runs through The Vines area of Droitwich which was originally referred to as the In Liberties, and was that part of Dodderhill parish lying within the Droitwich Borough. The parish boundary of the present Wychbold parish does not extend anywhere near this area. The tolls to be charged to use the canal were listed in the Act of Parliament so that the people planning to become shareholders could identify their potential profit. The Parliamentary Acts necessary for the building of this canal were passed in 1791, 1798, 1804, 1808 and 1815. This canal which is 30 miles long commences at Farmer’s Bridge, Birmingham and runs south west to join the River Severn at Diglis, south of Worcester. The only section of this canal lying within the former Dodderhill and present Wychbold parishes is about half a mile between Astwood Lane Bridge and Astwood Bridge to the north, the boundary following the lane over the bridge in both cases. This section includes the Astwood flight of six locks which raise the level of the canal 42 feet. The construction of these locks held up the opening of the canal as the contractor had not used the material specified and was ordered to rebuild them. The original capital needed to construct the canal was £180,000 and was raised by selling shares of £100 each. Different rates if carried shorter distances. A Parliamentary Act of 1852, allowed the capital of £24,000 to be raised from a share issue for the construction of a canal link from the Worcester & Birmingham Canal at Hanbury Wharf to Droitwich to link with the Droitwich Canal. The canal with a total length of one and three quarter miles required seven locks falling 66 ft to link the two canals. 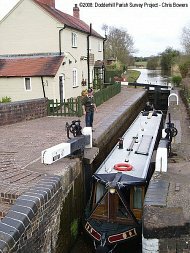 There are five narrow and deep locks and a sixth in Droitwich into the River Salwarpe where another, the seventh a broad lock takes vessels into the barge canal. This section is being reconstructed as part of the Droitwich Canal Project which will again see canal traffic using the network from Dodderhill through Droitwich and into the River Severn. Only the section of the canal alongside Hanbury Road is in Dodderhill. 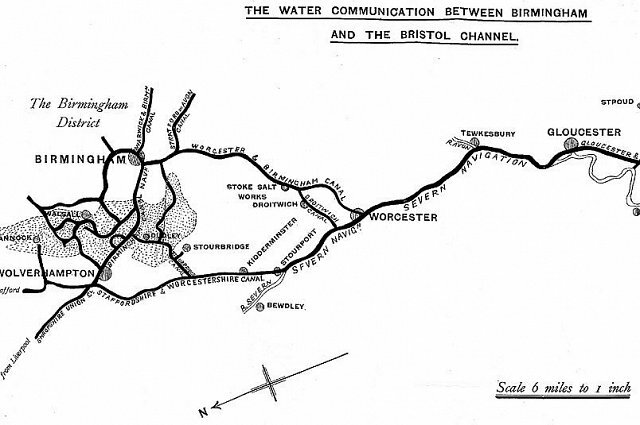 This map – reproduced with permission of Worcester Record Office – shows the canals linking Birmingham to Stoke Prior and then passing through Dodderhill, on their way to Droitwich and the River Severn. 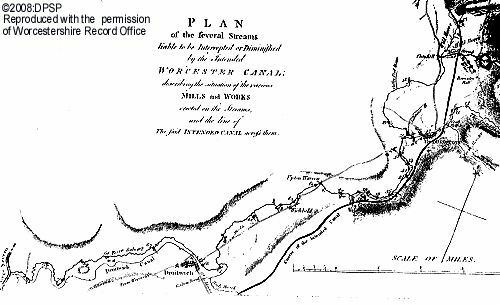 A Bill to Parliament of 1786 contains this map showing the route through Wychbold of the proposed Worcester Canal. This map – reproduced with permission of the Worcesteshire Record Office – shows the route the proposed Worcester Canal would have taken from Birmingham, through Wychbold and south to Worcester. Below is a large scale section of the proposed Worcester Canal showing the Wychbold section and giving the location of the mills of Dodderhill. Astwood Lane Locks are found on the Worcester and Birmingham Canal, to the north of Astwood Lane.